Our comfortable Standard Neoprene Knee is ideal for sports, work or home and offers good cartilage support to weak or tired knees or, after an injury, to take some strain off the joint while healing. 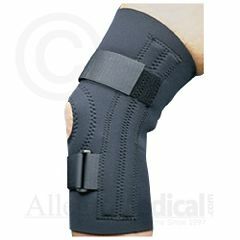 The contoured slip-on design features an open patella and a tapered back to provide comfort along the back of your knee. Dual compression straps, flexible metal spiral stays and a removable buttress pad offer a combination of support, stability and adjustability. Allows a full range of motion. Four-way stretch, one-eighth-inch neoprene lined with nylon provides comfortable support and compression and retains natural body heat for increased circulation and warmth to promote healing. Available in sizes XS-S-M-L-XL-2XL-3XL. Good support for patella. Lightweight. Must wear a brace at all times. Hard to find neoprene.